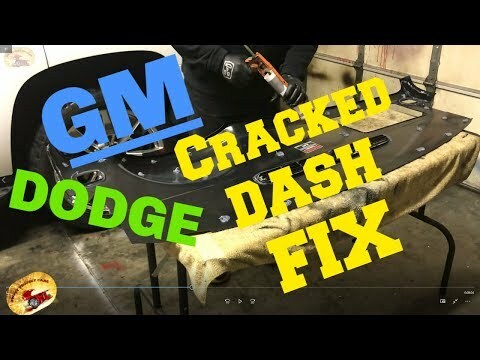 How to Repair your GM or Dodge Cracked and Busted dash in your Chevrolet, Ram, Cummins, Yukon, Tahoe or Suburban. This works for all SUV’s and Trucks. Dodge trucks with cracked dashes. Also on GMC Trucks and SUV’s. Due to factors beyond the control of SWEET PROJECT CARS, we cannot guarantee against the improper use or unauthorized modifications of this information. SWEET PROJECT CARS assumes no liability for property damage or injury incurred as a result of any of the information contained in these videos. Use this information at your own risk. SWEET PROJECT CARS recommends safe practices when working with tools seen or implied in our video and written content. Any injury, damage, or loss that may result from improper use of these tools, equipment, or from the information contained in this content is the sole responsibility of the user and not SWEET PROJECT CARS. So true, DIY'rs never throw anything away, especially when you live in the country and its 20 miles to the nearest hardware store. BTW I love those long plastic expandable shower rods with rubber ends for long wedges and clamps., and the dollar store shower curtains make nice drop cloths. I also realized my old dumbbell set is still being used for weights like you used. At least I can honestly say I'm still using my weights. I use 303 all the time thanks to you!!!! it is magic. thank you, partner, for sharing!!!!! 303, it's a great product. I have been binge watching your videos. Also letting my buddies know about your vids. What video is the one where you make the handy home made windshield cleaner? Nice video, Mike! I, fortunately, do not have this problem with a cracked dash, but it's nice to know how to fix it. One question though – With all the pressure applied with the reams of paper and the rods, it would seem to me that, if it is going to pop up somewhere, it would be along the rear edge over the instrument panel/radio/glove compartment. If the glue was strong enough to hold that edge down then shouldn't that glue be strong enough to hold other areas in place after it is hand pressed into place in those areas too? That is definitely a new one for me, wish I had known about it years ago. But I sure won't be forgetting it in a hurry! Seems a shame to cover it back up again. I've got a question for you though… Since they don't intend to remove it, would it make sense to use a dab of the filler putty to blend the seam on the sides? Or do you figure it just isn't worth the extra effort? Love your videos. Keep up the good work and happy Holidays from your neighbour to the North. I put a Roll n Lock bed cover on my Tundra in 2000. 303'd it since new and it is still there. Hi Sweet, Thanks for your videos. Got a question about steering wheels I hope you can help me with. I have an old 1988 BMW 5 series and I want to redo my steering wheel and I want it to be done with a foam material like I have seen on race cars. Can you give me guidance on how to pull this off? Thanks! Have you ever used Flex Seal liquid on a car, to help keep water from seeping in through A pillar? That's pretty slick right there!! Does your climate extremes have a big impact on the cracking? I'm contemplating a move back to the Midwest next year. Giving me something to think about :). Great video as always. Thanks for posting!! What is the glue you use in your calk gun? I guess that new dash got reamed!!!!!!! LOL, looks like a pretty easy install. Of course you make everything look easy Mike.